The Illini are off to a rough start. Things can always be worse. That rings true for Oklahoma State, which is 9-11 despite losing one-third of its scholarship players along the way this season. It especially holds meaning for Brad Underwood, who left Oklahoma State in 2017 for Illinois (his dream job! ), along with a pretty nice raise, despite taking OSU to the NCAA Tournament in Year 1. He likely thought the Illini were stocked for a quick rebuild, and with prime recruiting territory, a reboot could be in order immediately, if not sooner. But it seems he may have misjudged the situation … just a hair. 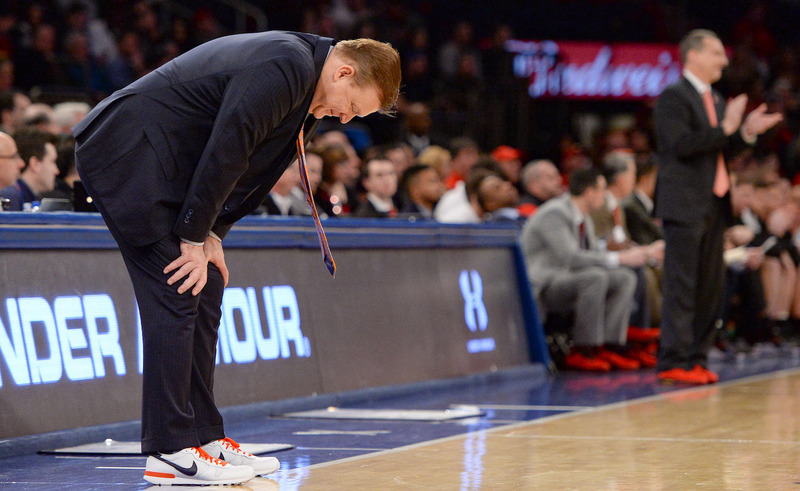 After falling to Minnesota on Wednesday night, the Illini’s 15th (!) loss of the season, Illinois fell to 6-15 on the season. For those tracking all this at home, that’s *carry the one, dot the i … * 28 losses in the last 38 games for Illinois. OSU, meanwhile, is 17-21 in its last 38 dating back to last season. Look, Underwood is a fine coach. Really. I actually think he can turn things around at Illinois (I’m not rooting for it), but the fact is that OSU basketball might, somehow, just maybe, be in a better situation, with more stability, under Mike Boynton than it would be with Underwood, despite the mangled contract situation that led him to leave in the first place. I still think Underwood would have crushed at OSU, no question. He had things rolling. (He also had an NBA-level point guard.) But the bottom line is that, two years removed from his shocking departure, Boynton and Co. are recruiting at a high level, they’re doing things the right way (even if walk-ons are being played in Big 12 games), and the future is bright no matter how grim the here and now is. Which, incredibly, is less grim than Illinois, which has a five-star future NBA point guard running the offense and enough talent to at least be better than the Big Ten’s doormat. Let’s check on how Illinois fans feel about Underwood. I have zero clue what Brad Underwood is even trying to do on defense. brad underwood, the 3 million dollar man, loses again. Brad Underwood is 20-33 at Illinois, and 40-46 since leaving Stephen F. Austin. So OSU fans … it could be worse. It might get worse this season. But right now, Boynton > Underwood seems kind of like a no-brainer, no? Anyhow, Boynton’s hiring in 2017 is now a fascinating sliding doors moment. Underwood staying would have been best, if only because it would have made OSU look less than an ideal landing spots for premier coaches hoping to get paid, but there are innumerable possibilities as to how it could have played out. Underwood could have stayed, and maybe been great. Underwood could have stayed, and maybe sucked (and still got paid). Boynton could have been hired (this one actually happened). Lamont Evans, who is now going to serve prison time (! ), could have been hired. Heck, Archie Miller was even a name thrown out there. And Indiana right now absolutely stinks! All this to say that every situation should be taken into context. I think Miller and IU will work out as a fine marriage. I think the same of Boynton and OSU. I’m way less sure about Underwood and Illinois. But the bottom line is this: It takes time to build a program, to recruit, to develop resources, to develop talent, to develop trust with a fanbase. Nothing happens in a vacuum. So while Underwood and Illinois stink (and that goes double for Indiana and OSU), they may not stink forever. It’s Year 2 of a rebuild for three (two?) programs with promising futures. Let’s reserve judgement for how these hires actually turned out when these coaches actually have time to build. And yes, that even includes Brad Underwood and Illinois.